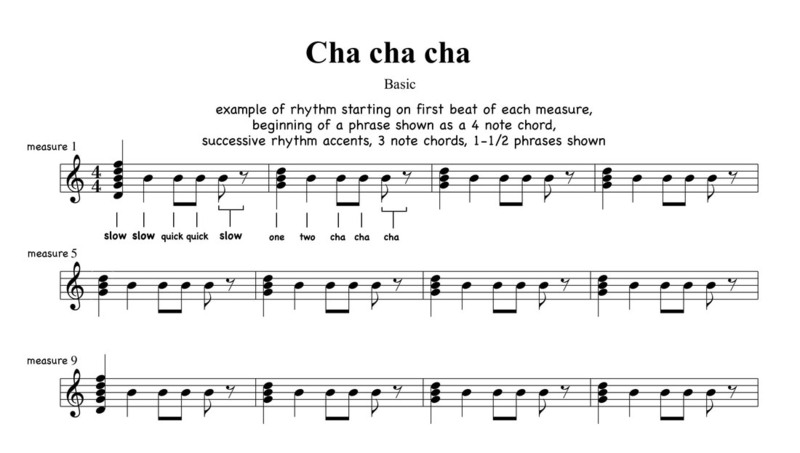 from ﻿﻿Wikipedia﻿﻿: Originally known as the Cha Cha Cha, became known as simply the Cha Cha. It was developed by Enrique Jorrin in Havana around 1953 with mambo roots and from the danzon, providing a somewhat simpler rhythm for club dancers. Danced in 4/4 time ... the ballroom cha-cha relies on compact steps and follows a rhythmic pattern of slow, slow, quick-quick, slow. "Tea for Two", a Vincent Youmans tune utilizes Cha Cha rhythms. "Somthin' Stupid" by Carson Parks and popularized by Frank & Nancy Sinatra is another. ​Chords indicate the accented beat. The rest in the Basic Rhythm makes the last 1/8 note feel like a 'slow'.